Key Take-Away: The Iraqi Federal Court ruled that two key sessions of the Council of Representatives (CoR) in April, one held by legitimate CoR and the other held rebelling members of a rump parliament, were illegal. The ruling stated that the April 14 rump CoR session, when rebelling CoR members illegally voted to remove CoR Speaker Salim al-Juburi from his position, was invalid as it did not meet quorum. The Federal Court also ruled that the April 26 regular CoR session that voted in five new technocratic ministers was invalid due to unconstitutional procedure of the session. The former decision deals a blow to the Reform Front – the incarnation of the rebelling CoR members and the rump parliament – as one of its primary objectives has been to remove Speaker Juburi from office and replace him with a member of the Reform Front. Some of their members stated that the group would return to the CoR and attempt to vote out Speaker Juburi once more. The Reform Front’s return could help the CoR make quorum and recommence legislative work, but political stability is far from likely. The second decision to nullify the April 26 session undermines PM Abadi’s credibility by highlighting his inability to carry out even a compromise cabinet reform, let alone a preferred full reshuffle. The CoR is slated to reconvene in early July. Even if it reaches quorum, the perpetually-stalled reform agenda, calls by Muqtada al-Sadr and other firebrand CoR members for resignations of senior government members, and a fracturing Kurdistan Alliance all but ensure a delay on progress for important legislation. Continued disruptive behavior and obstructionism will likely continue within the CoR, and further momentum could build for a no-confidence vote in PM Abadi in the wake of Federal Court’s decision. Four ISIS-linked Salafi-Jihadi groups in Philippines released a video on June 21, 2016 including an official logo for ISIS in Philippines, implying direct affiliation with ISIS. The four groups in the video are the Abu Khubayb Brigade, the Jundallah Battalion, the Abu Sadr Battalion, and the Abu Dujana Brigade. The video included fighters speaking either from Philippines or from Raqqa, Syria. The fighters announced that groups in Philippines have both consolidated as one organization and are operating under an emir, Abu Abdullah al-Filipini aka Isnilon Hapilon, which would meet two prerequisites for official wilayats outlined by ISIS’s leader, Abu Bakr al-Baghdadi in 2014. Isnilon Hapilon is the leader of Abu Sayyaf Group, a former associate of al-Qaeda that pledged bayat to Baghdadi twice between 2014 and 2016. ISIS’s official weekly newsletter al Naba also referred to Hapilon as a commander in Philippines in April 2016, indicating a previous endorsement by ISIS. The groups in the video are operationally capable and conducting attacks, some likely including fighters that have returned from Syria. ISIS began to claim attacks by these groups in Philippines in April 2016. ISIS has not announced Wilayat Philippines officially, but it may do so as part of its Ramadan campaign to demonstrate that it continues to expand to new regions. ISIS may declare additional wilayats during Ramadan, for example in Bangladesh, where similar prerequisites have already been met. 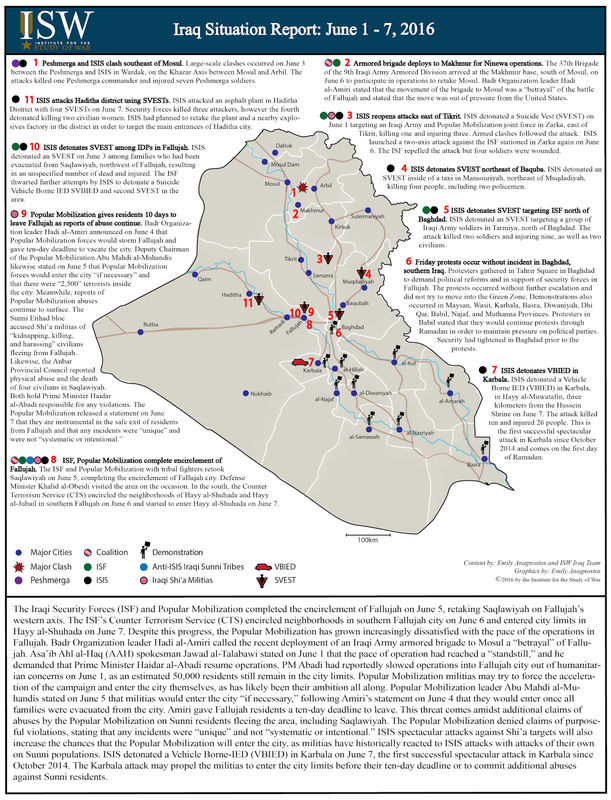 Key Take-Away: The Iraqi Security Forces (ISF) made significant gains in recapturing Fallujah from ISIS, but areas recaptured in the future face the risk of instability. As of June 20, the ISF have cleared most of the neighborhoods in Fallujah, excluding some of its northern neighborhoods. Nevertheless, the proliferation of Iraqi Shi’a militias in Fallujah’s northern suburbs could pose a serious problem to the area’s stability. Reports of abuses against Sunni civilians north of Fallujah by Popular Mobilization and Federal Police were serious enough that security forces encouraged Sunni civilians to flee south towards Amiriyat al-Fallujah. Members of the Badr Organization’s 5th Brigade, whose commander is also a senior commander in the Federal Police (FP), entered the city alongside the FP and Emergency Response Division (ERD), forces linked to the Badr Organization-controlled Interior Ministry (MoI), during the course of the operation. The presence of Iraqi Shi’a militias both inside and around Fallujah increases the possibility of sectarian violence against the Sunni Arab residents of Fallujah, which has long served as a support zone for extremist Sunni groups against the locally unpopular Shi’a-dominated national government. Meanwhile, the Iraqi government will likely rely on local Sunni Arab tribes with knowledge of the area’s human networks to provide fighters for recaptured areas’ security and identifying ISIS collaborators. This collaboration could result in the government empowering certain Sunni tribal power brokers over others with whom they are rivals, which may lead to inter- and intra-tribal violence and settling of old scores as Internally-Displaced Persons (IDPs) return to their homes in the Fallujah area. 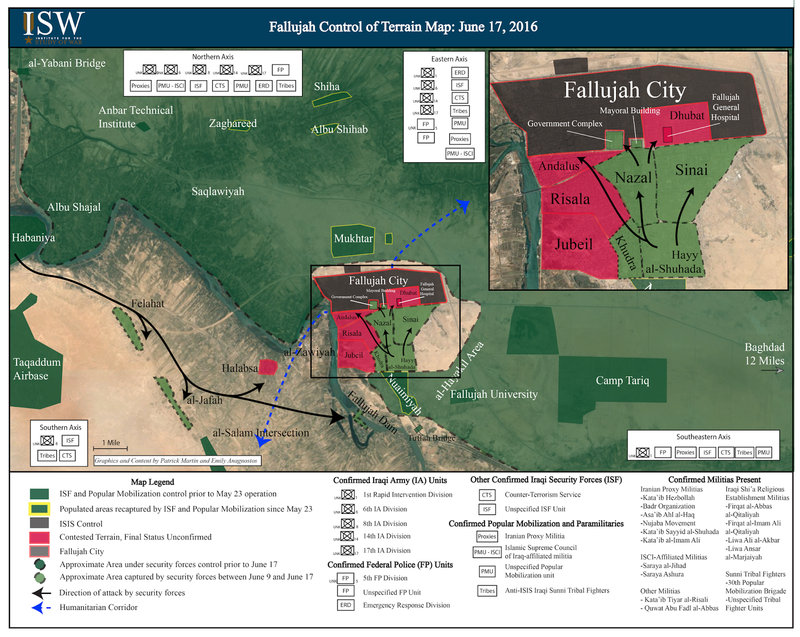 Fallujah’s stability is critical to the success of future operations against ISIS in Ninewa and western Anbar. Furthermore, the Iraqi government must demonstrate its ability to provide for its citizens to regain the trust and support of the Sunni-Arab populations currently living in ISIS territory; if violence against Fallujah’s Sunni Arabs continues, conditions for IDPs in camps remain poor, Fallujah’s heavily damaged interior and suburbs are not rebuilt, and reconstruction money is stolen, then Sunni Arabs in ISIS-held areas of Iraq may not welcome the ISF when their areas are recaptured. The ISF must recapture and hold Fallujah and all other predominantly-Sunni Arab areas in an inclusive manner devoid of ethnic, sectarian, and tribal violence, which will require a force that excludes Iraqi Shi’a militias and includes Sunni Arab fighters. Territorial victories will otherwise be accompanied by long-term instability, allowing ISIS or other extremist groups an opportunity for resurgence. The Iraqi Government and the U.S.-led anti-ISIS Coalition will need to keep these lessons in mind as the ISF commence the difficult push from northern Salah al-Din Province into Ninewa towards Mosul. Russia has escalated its air campaign in Syria in an effort to deter and undermine Western military action. ISW assesses with high confidence that Russian airstrikes targeted areas held by the U.S.-backed New Syrian Army near the Syrian al Tanaf border crossing with Iraq on June 16. The U.S. trained and equipped the New Syrian Army to fight ISIS in southeastern Syria. The U.S. sent jets to intercept and prevent additional attacks, but Russian warplanes returned to conduct a second strike against New Syrian Army positions while the American jets refueled, according to anonymous U.S. Defense Officials. Russia and the U.S. held a teleconference on June 18 to discuss the incident, during which Russia requested that the U.S. “share coordinates” of U.S.-backed opposition groups in Syria. The Russian Ministry of Defense announced that the two sides agreed to “[aim] to improve the coordination on fighting the terrorist organization in Syria,” but did not specify any new measures to prevent the targeting of U.S.-backed groups. The strikes are a clear demonstration of Russia’s willingness to escalate with the U.S. and likely belief that the U.S. will be unwilling to sufficiently counter the provocation. The attack against the New Syrian Army follows an increased American military response to Russian activity in Syria over recent weeks. The U.S. deployed the USS Harry S. Truman Carrier Strike Group on June 3 to the Mediterranean Sea in order to conduct strikes against ISIS in Iraq and Syria and offset increased Russian naval capabilities in the Mediterranean. Russia subsequently deployed long-range naval reconnaissance and anti-submarine warfare aircraft to theater, which local Syrian activists documented in Aleppo Province on June 5. 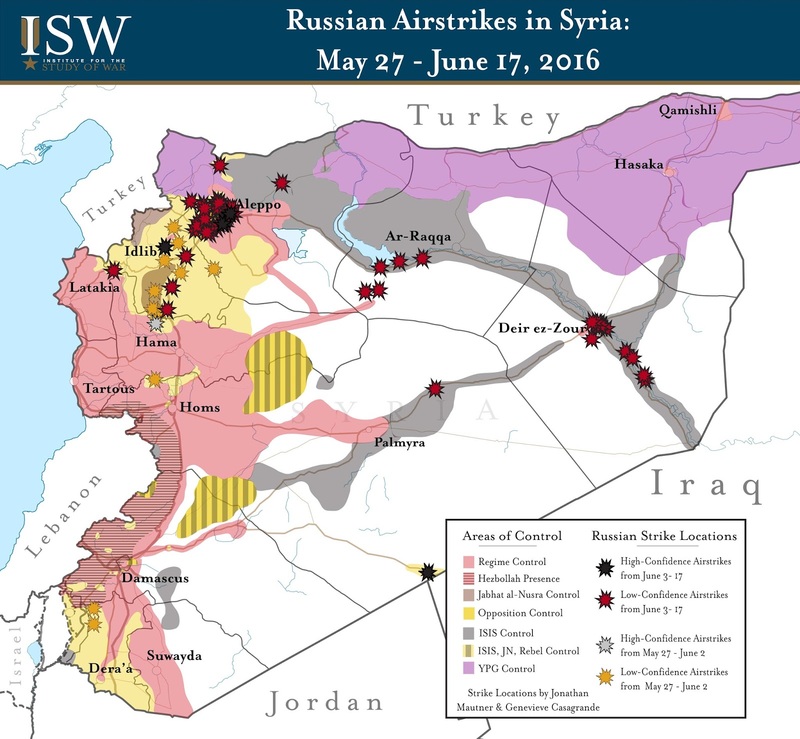 Russia also began to project force into Eastern Syria from June 5 - 17, intensifying its own aerial bombardment of ISIS-held terrain in ar-Raqqa and Deir ez-Zour Provinces. The U.S. has nonetheless continued to conduct strikes against ISIS from the Mediterranean. The U.S. also deployed the Dwight D. Eisenhower Carrier Strike Group to the Mediterranean on June 13, which will reportedly remain in the Mediterranean after the Truman returns to the U.S. in late June. The deployments of U.S. strike carrier groups are likely an effort to deter a continued Russian buildup of air and naval anti-access/area denial (A2AD) capabilities in the Eastern Mediterranean. 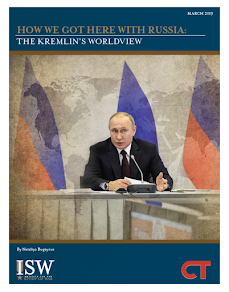 Russia’s attacks against American-backed groups in Syria and the expansion of its air campaign into ISIS-held terrain demonstrate that Russia will continue to change conditions on the ground in Syria in order to undermine American interests. Russian airstrikes during the first two weeks of June increased to rates that “exceeded the pre-cessation of hostilities totals” in Aleppo Province, according to Director of the CIA John Brennan. In response, U.S. Secretary of State John Kerry stated on June 15 that the U.S. is not “going to sit there while Assad continues to offensively assault Aleppo and while Russia continues to support in that effort.” Russia nonetheless continued to bombard opposition-held areas in Aleppo Province amidst a temporary ceasefire agreement in Aleppo City from June 16 - 17. ISW assessed a total of 14 Russian strike locations in the Aleppo area with low and high confidence during that time period. Russia’s claim to adhere to a ceasefire despite continuing its air campaign obfuscates its role in exacerbating the Syrian conflict. Russia’s violation of the ceasefire agreement demonstrates that it remains undeterred from continuing its campaign against the Syrian opposition despite American rhetoric threatening greater U.S. response. Key Takeaway: The Iraqi Security Forces (ISF) has made significant progress in its operation to retake Fallujah, but the city is not fully cleared. Prime Minister Haidar al-Abadi announced the full recapture of Fallujah on June 17, following the recapture of the government complex. However, the northern neighborhoods of the city remain controlled by ISIS, and several western neighborhoods are still contested. Even as the ISF operation is on the verge of military success in Fallujah, it is poised to be a political failure. The Badr Organization, an Iranian-backed Shi’a proxy militia, has entered the city limits alongside pro-Iranian ISF elements. The Badr Organization’s presence, following continued Shi’a abuses against Sunni residents, will be a sectarian trigger that will undermine the Iraqi Government’s efforts to reconcile Sunni elements. 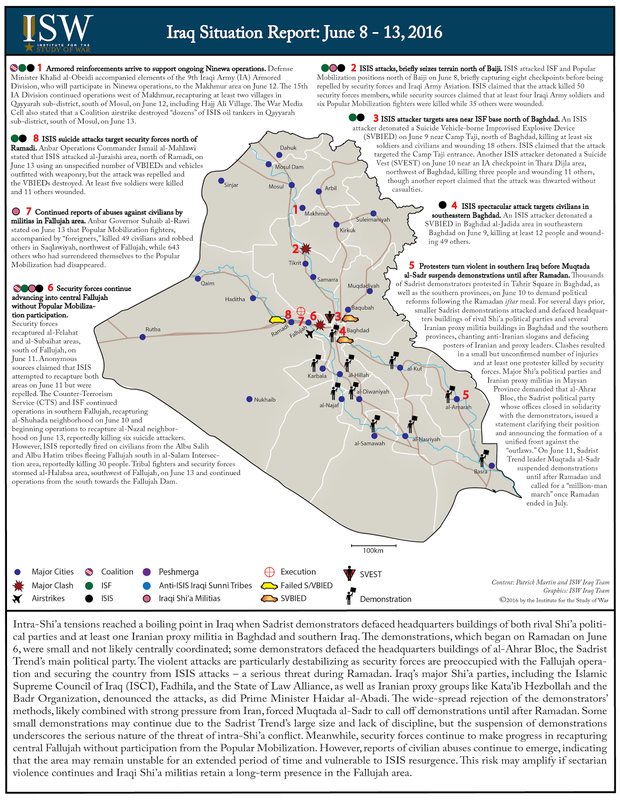 The Fallujah operation will be a mission failure – even if the city is physically recaptured – as long as the Iraqi Government does not address the Sunni political marginalization which made Fallujah passive towards ISIS’s takeover of the city in December 2013. Intra-Shi’a tensions reached a boiling point in Iraq when Sadrist demonstrators defaced headquarters buildings of both rival Shi’a political parties and at least one Iranian proxy militia in Baghdad and southern Iraq. The demonstrations, which began on Ramadan on June 6, were small and not likely centrally coordinated; some demonstrators defaced the headquarters buildings of al-Ahrar Bloc, the Sadrist Trend’s main political party. The violent attacks are particularly destabilizing as security forces are preoccupied with the Fallujah operation and securing the country from ISIS attacks – a serious threat during Ramadan. Iraq’s major Shi’a parties, including the Islamic Supreme Council of Iraq (ISCI), Fadhila, and the State of Law Alliance, as well as Iranian proxy groups like Kata’ib Hezbollah and the Badr Organization, denounced the attacks, as did Prime Minister Haidar al-Abadi. The wide-spread rejection of the demonstrators’ methods, likely combined with strong pressure from Iran, forced Muqtada al-Sadr to call off demonstrations until after Ramadan. Some small demonstrations may continue due to the Sadrist Trend’s large size and lack of discipline, but the suspension of demonstrations underscores the serious nature of the threat of intra-Shi’a conflict. Meanwhile, security forces continue to make progress in recapturing central Fallujah without participation from the Popular Mobilization. However, reports of civilian abuses continue to emerge, indicating that the area may remain unstable for an extended period of time and vulnerable to ISIS resurgence. This risk may amplify if sectarian violence continues and Iraqi Shi’a militias retain a long-term presence in the Fallujah area. ISIS currently faces an unprecedented threat to its core terrain in Northern Syria from an array of competing actors. The U.S.-backed Syrian Democratic Forces surrounded the key transit hub of Manbij in Eastern Aleppo Province on June 9, threatening to sever the last remaining supply lines available to ISIS over the Syrian-Turkish Border. Meanwhile, ISIS’s stronghold of Ar-Raqqa City faces mounting pressure as both the U.S.-led coalition and pro-regime forces advance into its countryside. These combined pressures forced ISIS to withdraw from its frontlines with opposition forces in Northern Aleppo Province in order to prioritize the defense of its core terrain. Nonetheless, the degrading position of ISIS in Northern Syria is poised to ignite further conflict between local and regional actors that may jeopardize future successes. The terrain vacated by ISIS will likely host renewed competition between Syrian Kurds, opposition groups, and pro-regime forces as well as a geopolitical struggle involving Turkey, Syria, Russia, and the U.S. These conflicts could strain the international anti-ISIS coalition and stall further progress against ISIS in Syria unless the U.S. can successful navigate the conflicting interests of its allies and adversaries in the region. ISIS currently faces unprecedented pressure in Northern Syria. The U.S.-led anti-ISIS coalition has long pursued a campaign to isolate and ultimately seize Ar-Raqqa City – the de-facto capital of ISIS in Syria. This strategy has included several separate lines of effort over the past twelve months to sever the ground lines of communication linking Ar-Raqqa City to Mosul in Iraq as well as the Syrian-Turkish Border. These cumulative efforts planted the seeds for actors on the ground to achieve nonlinear effects against the organization. Over the past ten weeks, an array of groups, including Syrian Kurds backed by the U.S., Sunni Arabs backed by Turkey, and the Syrian Arab Army backed by Russia and Iran, have exploited these vulnerabilities to varying degrees. ISIS will likely lose access to its cross-border flows of foreign fighters and supplies over the near-term, leaving the organization vulnerable throughout its core terrain in Iraq and Syria. Nonetheless, the ongoing successes against ISIS in Northern Syria remain uncoordinated and localized. The major factions active on the ground view each other with hostility and often operate at cross-purposes to one another. The competing actors also aim to leverage their independent campaigns in Northern Syria to their own ends despite their ostensible shared goal to defeat ISIS in Syria. The Syrian Kurds harbor ambitions to unite their disparate cantons and construct a contiguous autonomous zone upon terrain formerly held by ISIS along the Syrian-Turkish Border; Turkey aims to use its network of allied opposition groups to check the Syrian Kurds and block their future expansion; and the regime and its allies hope to exploit anti-ISIS operations in order to reassert their claims to domestic rule and international legitimacy. These competing motives and actions set the stage for future conflict that could strain the international anti-ISIS coalition and allow ISIS to preserve its control of terrain along the Euphrates River Valley in Eastern Syria over the long-term. The Syrian Democratic Forces – a U.S.-backed coalition consisting of the Syrian Kurdish YPG and allied opposition groups – represents the primary ground partner in the fight against ISIS in Syria. The U.S. began providing direct air support to the Syrian Kurdish YPG in September 2014 in order to blunt an ISIS offensive on the border town of Kobani (Ayn al-Arab) in Eastern Aleppo Province. The military partnership continued to expand over time as the Syrian Kurdish YPG demonstrated its effectiveness against ISIS on the battlefield. 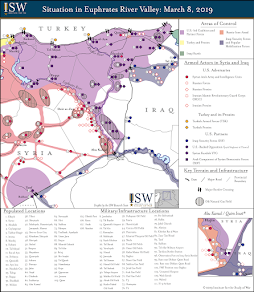 U.S. President Barack Obama authorized the deployment of up to fifty U.S. Special Operations Forces soldiers to Northern Syria in October 2015 in order to “train, advise, and assist” the Syrian Kurdish YPG as well as allied tribal and opposition groups in the so-called Syrian Arab Coalition as part of the newly-formed Syrian Democratic Forces. This deployment occurred despite long-standing reservations from Turkey, which considers the Syrian Kurdish YPG to be a terrorist organization due to its links to the Kurdistan Workers’ Party (PKK). By the end of 2015, the Syrian Democratic Forces controlled the majority of the Syrian-Turkish Border and occupied a bridgehead across the Euphrates River at the Tishreen Dam. The U.S. intensified its cooperation with Syrian Democratic Forces in early 2016 in order to accelerate operations aimed at isolating and seizing the ISIS stronghold of Ar-Raqqa City. The U.S. expanded its deployment of Special Operations Forces by an additional 250 personnel in April 2016. U.S. Special Envoy to the Anti-ISIS Coalition Brett McGurk later stated on May 15 that a “pressure campaign” on Ar-Raqqa City would begin over the “coming weeks and months.” U.S. CENTCOM Commander Gen. Joseph Votel later conducted an unannounced visit to Northern Syria on May 21 in order to review campaign plans with the leaders of the Syrian Democratic Forces and the affiliated Syrian Arab Coalition. These efforts laid the groundwork for the start of a new phase of the anti-ISIS campaign on the ground. On May 24, the Syrian Democratic Forces announced an operation to “liberate” the northern countryside of the ISIS stronghold of Ar-Raqqa City. The Syrian Democratic Forces achieved initial gains despite the presence of a large number of IEDs and later expanded the operation to target the town of Tabaqa west of Ar-Raqqa City on May 30, although a spokesperson clarified that the ongoing offensive did not aim to contest the city itself. The looming territorial expansion of the Syrian Kurds in Northern Syria prompted fierce resistance in Turkey. Deputy Chief of the Turkish General Staff Gen. Yasar Guler reportedly warned U.S. CENTCOM Commander Gen. Joseph Votel after his visit to Northern Syria that the Syrian Kurdish YPG would “let him down when the fight gets tough” and urged the U.S. to expand its support to Turkish-backed opposition groups in Northern Aleppo Province. On May 25, tensions flared further after the release of photographs showing U.S. Special Operations Forces in Northern Syria wearing the shoulder patches of the Syrian Kurdish YPG. Turkish Foreign Minister Mevlut Cavusoglu denounced the incident as an “unacceptable…double standard” while Turkish President Recep Erdogan stressed that the images illustrated the “wrong steps” being taken in cooperation with “terrorist groups.” The U.S. ordered its soldiers to remove the patches within days, but the vast gap between the positions of the two countries remained clear. On May 30, Turkey proposed a joint deployment of Special Operations Forces with the U.S. and other allies to clear ISIS from the Syrian-Turkish Border and open a “second front” against ISIS in Ar-Raqqa City on the condition that the coalition embed with local opposition groups rather than the Syrian Kurdish YPG. These plans failed to gain traction. The operation in Northern Ar-Raqqa Province that provoked the ire of Turkey nonetheless obscured the true objective of the Syrian Democratic Forces – the key town of Manbij in Eastern Aleppo Province. Manbij serves as ISIS’s main “transit hub for foreign fighter flows” as well as a base for its international terrorist attacks. The seizure of the town also serves the overall strategic objective to isolate Ar-Raqqa City from its last remaining supply routes to the Syrian-Turkish Border. On May 31, the Syrian Democratic Forces advanced on Manbij from the direction of their beachhead at the Tishreen Dam. At the same time, a separate detachment conducted a forced crossing of the Euphrates River and repaired the Qarah Qawzaq Bridge, opening a new front east of Manbij. These forces converged on Manbij with the support of coalition airstrikes and successfully isolated the town from three sides on June 9, placing ISIS under severe pressure even as the Syrian Democratic Forces vowed that the campaign would continue “until the liberation of the last inch of land in Manbij and its rural areas.” U.S. officials stressed that the design of the operation minimized the participation of the Syrian Kurdish YPG in accordance with the concerns held by Turkey. Operation Inherent Resolve Spokesperson Col. Chris Garver stated that “local Arabs” comprised approximately 85% of the 3,000 fighters participating in the operation. Turkey responded cautiously to the ongoing offensive on Manbij. Turkish Deputy Prime Minister Numan Kurtulmus stated on May 31 that the potential expansion of the Syrian Kurdish YPG west of the Euphrates River “constitutes a national security line for Turkey” and that Turkey rejected any military participation in the operation as “out of question.” Nonetheless, President Erdogan acknowledged on June 2 that roughly 2,500 of the 3,000 fighters participating in the operation are Sunni Arabs with Syrian Kurds operating as a “logistical force.” Foreign Minister Cavusoglu later stated on June 7 that the U.S. had “given a guarantee” that the Syrian Kurdish YPG would withdraw east of the Euphrates River after the completion of the operation to seize Manbij. If implemented, these concessions will likely prove sufficient to prevent Turkey from acting to undermine the operation. Nonetheless, it remains an open question whether the Syrian Kurdish YPG intends to honor the deal given its long-term strategic objective to unite all of its cantons along the Syrian-Turkish Border. The loose coalition of Sunni Arab opposition groups supported by Turkey in Northern Aleppo Province constitutes another key group of actors engaging in anti-ISIS operations in Northern Syria. These groups span a wide ideological range – from Free Syrian Army (FSA)-affiliated moderate secularists to Islamists linked with the Muslim Brotherhood to Salafi-Jihadist group Ahrar al-Sham – but remain united in their opposition to ISIS. The groups contain a large number of local fighters with a strong motivation to defend their hometowns, particularly the key urban centers of Mare’a and Azaz. Northern Aleppo Province thus represents potential fertile ground for the development of a Sunni Arab partner against ISIS. The U.S. Department of Defense attempted to mobilize this community in an ill-fated ‘train-and-equip’ program that ended in October 2015. The U.S. has since provided training to “dozens” of fighters in Northern Aleppo Province as part of a restructured ‘train-and-equip’ program that embedded these fighters with several smaller factions along the so-called Mare’a Line, including Liwa al-Hamza, Liwa 99, and Liwa al-Mutasem. Turkey has promoted support for Turkmens, Islamists, and other opposition groups in Northern Aleppo Province as a counterweight to further expansion by the Syrian Kurdish YPG. Turkey allowed several hundred opposition fighters to transit through its territory from Idlib Province in order to reinforce Mare’a and Azaz amidst a pro-regime offensive on the region in February 2016. Turkey also provided the opposition in Northern Aleppo Province with fresh supplies of mortars, rockets, and other munitions over the same time period. Former Turkish Prime Minster Ahmet Davutoglu stressed on February 18 that “the whole world should know…we will not allow Azaz to fall.” Meanwhile, Turkey pressed the U.S. and other coalition allies to expand their own support for the opposition in Northern Aleppo Province. For example, President Erdogan previously conditioned his support for the operation to seize Manbij in Eastern Aleppo Province upon the expansion of the coalition air campaign along the Mare’a Line. These lobbying efforts led the U.S. to provide its support to an opposition-led offensive to clear ISIS from the Syrian-Turkish Border. On April 7, the Hawar Kilis Operations Room – a coalition of opposition groups that included fighters vetted by the ‘train-and-equip’ program – seized the ISIS-held border town of Al-Rai in Northern Aleppo Province with the aid of cross-border artillery fire and coalition airstrikes. The advance severed a key route for smuggling foreign fighters and supplies, and left ISIS with little more than thirty miles of remaining border access. The rapid offensive along the border nonetheless left opposition forces vulnerable to an attack on their exposed southern flank. ISIS launched a two-pronged counteroffensive on April 10 - 14, recapturing the town of Al-Rai and temporarily entrapping opposition groups in a pocket along the Syrian-Turkish Border. The opposition continued to suffer a steady erosion in terrain over subsequent weeks, culminating in a major attack by ISIS on May 27 that punctured the Mare’a Line and threatened to overwhelm remaining opposition forces in Mare’a and Azaz. The near-destruction of opposition groups in Northern Aleppo Province nonetheless generated significant impetus for the U.S. and Turkey to boost their capabilities on the ground. The U.S. expanded its military support to select opposition groups, conducting two much-needed airdrops of weapons and ammunition to Liwa al-Mutasem in Mare’a on June 2 and June 6. On June 7, Liwa al-Mutasem announced the integration of all opposition factions in Mare’a under its leadership, likely due in part from its status as an outlet for external support. Meanwhile, mounting pressure from the Syrian Democratic Forces at Manbij and Ar-Raqqa City forced ISIS to deprioritize its operations against the opposition. ISIS withdrew from large parts of Northern Aleppo Province on June 8, lifting the sieges of Mare’a and Azaz. The opposition – forged under the pressure of a relentless assault by ISIS - now sits in an optimal position to resume operations along the Syrian-Turkish Border under a unified leadership with strong external backing. The intensifying fight against ISIS in Northern Syria also motived Syrian President Bashar al-Assad and his foreign allies to escalate their own operations under the guise of the fight against terrorism. On June 2, the Syrian Arab Army and allied paramilitary forces supported by Russian aircraft launched an operation in the direction Ar-Raqqa City from the crossroads of Ithriya in Eastern Hama Province, taking advantage of the ongoing fight against ISIS in Manbij. Video footage showed large numbers of armored vehicles, multiple rocket launcher systems, and field artillery participating in the offensive. Pro-regime forces advanced rapidly along the open desert highway, entering the boundary of Ar-Raqqa Province on June 4 and seizing a key road junction roughly twenty miles from Tabaqa west of Ar-Raqqa City on June 7. On the same day, President Assad vowed to “liberate every inch of Syria” as part of the “war against terrorism” in a speech before the Syrian Parliament. ISIS responded to this pressure by deploying a column of reinforcements to Tabaqa from Ar-Raqqa City while mounting probing attacks to disrupt the regime ground line of communications further west. Pro-regime forces likely remain incapable of seizing Ar-Raqqa City or other ISIS-held urban areas. The advance nonetheless allows the regime to stake its claim to Ar-Raqqa Province while positioning for follow-on operations to exploit further losses by ISIS at the hands of the Syrian Democratic Forces. The offensive also provides Syrian President Bashar al-Assad and Russian President Vladimir Putin with an opportunity to impose their strategic priorities on the U.S. and its coalition allies. Russian Foreign Minister Sergey Lavrov floated a proposal for the U.S. and Russia to coordinate operations against Ar-Raqqa City in March 2016. The U.S. flatly rejected this offer, but the presence of pro-regime forces outside of Ar-Raqqa City would at a minimum force the U.S. to engage in battlefield deconfliction – opening the door for Syria and Russia to message their role as valuable partners against ISIS before the international community. The multi-sided fight for Northern Syria over the coming months will likely complicate efforts by the U.S. to maintain the focus and coherence of its local partners on the fight against ISIS. The Syrian Kurdish YPG maintains a long-term strategic objective to form a contiguous autonomous zone along the Syrian-Turkish Border, calling into question the ability of the U.S. to maintain its guarantees to Turkey. The Syrian Kurdish YPG could elect to establish a land corridor to the Afrin Canton in Northern Aleppo Province rather than press the fight against Ar-Raqqa City – a move that could find support from Russia. This decision would likely provoke significant military retaliation from both Turkey and local opposition groups, fracturing the tenuous coalition of anti-ISIS actors in Northern Syria. Even in a best-case scenario, Northern Aleppo Province will likely constitute a venue for continued skirmishes between Sunni Arabs and Syrian Kurds stemming from historical rivalries, ethnic tensions, and foreign interference by Turkey. Meanwhile, pro-regime forces remain positioned to exploit gains against ISIS for their own ends. Pro-regime forces sit outside the key urban centers of Al-Bab in Aleppo Province and Tabaqa in Ar-Raqqa Province in anticipation of future opportunities to secure new terrain and broadcast their claims of effectiveness in the “war against terrorism.” The decision to prioritize these efforts reflects the overriding strategic aim shared by Syria, Russia, and Iran – namely, the expulsion of the U.S. and all vestiges of its influence in the region. This objective provides pro-regime forces with an incentive to subvert and undermine the international coalition against ISIS in favor of their own regional security structures. At the same time, the campaign for Northern Syria will open new opportunities for Russia to threaten Turkey and thereby pressure the southern flank of NATO. Russia has expressed interest in expanding its ties with the Syrian Kurdish YPG in Northern Syria and faces accusations of providing material support including man-portable air defense systems (MANPADS) to the Kurdistan Workers’ Party (PKK) insurgency in Turkey. A competition for control over Northern Syria will provide Russian President Vladimir Putin with additional avenues to pursue this policy. At the same time, the campaign in Northern Syria remains insufficient to defeat ISIS over the long-term. The seizure of key terrain along the Syrian-Turkish Border in Aleppo Province will deny ISIS easy access to the flow of foreign fighters and supplies that replenish its forces and bolster the staying power of its so-called ‘caliphate’. Nonetheless, local forces on the ground remain incapable of seizing ISIS’s stronghold of Ar-Raqqa City over the near-term. Neither the Syrian Democratic Forces nor pro-regime forces possess the forces necessary to contest the urban terrain of the city itself without mustering new recruits and risking overextension on other battlefronts. This constraint will be exacerbated by any military competition over terrain formerly held by ISIS in Aleppo Province. Moreover, the fall of Ar-Raqqa City remains insufficient to defeat ISIS along the remainder of the Euphrates River Valley. ISIS thus stands to maintain its presence in Eastern Syria over the long-term despite – or perhaps, because of – the multiple forces arrayed against it. The Iraqi Security Forces (ISF) and Popular Mobilization completed the encirclement of Fallujah on June 5, retaking Saqlawiyah on Fallujah’s western axis. The ISF’s Counter Terrorism Service (CTS) encircled neighborhoods in southern Fallujah city on June 6 and entered city limits in Hayy al-Shuhada on June 7. Despite this progress, the Popular Mobilization has grown increasingly dissatisfied with the pace of the operations in Fallujah. Badr Organization leader Hadi al-Amiri called the recent deployment of an Iraqi Army armored brigade to Mosul a “betrayal” of Fallujah. Asa’ib Ahl al-Haq (AAH) spokesman Jawad al-Talabawi stated on June 1 that the pace of operation had reached a “standstill,” and he demanded that Prime Minister Haidar al-Abadi resume operations. PM Abadi had reportedly slowed operations into Fallujah city out of humanitarian concerns on June 1, as an estimated 50,000 residents still remain in the city limits. Popular Mobilization militias may try to force the acceleration of the campaign and enter the city themselves, as has likely been their ambition all along. Popular Mobilization leader Abu Mahdi al-Muhandis stated on June 5 that militias would enter the city “if necessary,” following Amiri’s statement on June 4 that they would enter once all families were evacuated from the city. Amiri gave Fallujah residents a ten-day deadline to leave. This threat comes amidst additional claims of abuses by the Popular Mobilization on Sunni residents fleeing the area, including Saqlawiyah. The Popular Mobilization denied claims of purposeful violations, stating that any incidents were “unique” and not “systematic or intentional.” ISIS spectacular attacks against Shi’a targets will also increase the chances that the Popular Mobilization will enter the city, as militias have historically reacted to ISIS attacks with attacks of their own on Sunni populations. ISIS detonated a Vehicle Borne-IED (VBIED) in Karbala on June 7, the first successful spectacular attack in Karbala since October 2014. The Karbala attack may propel the militias to enter the city limits before their ten-day deadline or to commit additional abuses against Sunni residents. Key Takeaway: The Council of Representatives (CoR) successfully reached quorum and convened two sessions on May 29 and May 31. The CoR struggled to reach this threshold since members formed a rump CoR on April 12. Despite the limited success of May 29 and 31, the CoR has not returned to its pre-April 12 state and many political blocs remain withdrawn. The CoR will not likely soon resolve fundamental issues in the political process needed to pass legislation required to acquire the critical International Monetary Fund (IMF) loan or address security breaches in Baghdad, which will likely require a reorganization of security forces in the capital. The sessions also exposed underlying fractures in the Reform Front between hardliners and compromisers, which will weaken the opposition bloc in the CoR and lead to the reintegration of some members to their original parties. The Reform Front is also in danger of losing its tenuous legitimacy and leverage as a nascent political party if the Federal Court strikes down the constitutionality of the rump CoR, the Reform Front’s predecessor. The CoR has already demonstrated that it can and will leave the Reform Front behind to continue to function. Additionally, Kurdish parties have lost their leverage over Baghdad as some Kurdish members ended their boycott without any promise of requested financial assistance. The failure to secure these funds has underscored the limit to Kurdish parties’ power in the Iraqi Government when operating outside the umbrella of the Kurdistan Alliance. The Council of Representatives (CoR) reached quorum and held its first meeting in a month on May 29, marking the slow thawing of political parties’ opposition to the political process. The CoR had fractured on April 12 when a group of members calling for the resignation of the three presidencies – Prime Minister Haidar al-Abadi, President Fuad Masoum, and CoR Speaker Salim al-Juburi – formed a rump parliament. The rump parliament passed a vote to dismiss Juburi on April 14 and denounced the CoR under Juburi as illegal. Even with the rump CoR acting separately, the legal CoR chaired by Juburi still managed to convene a session on April 26. At that meeting, attending members voted in five new ministers as a part of PM Abadi’s ongoing efforts to reshuffle the Council of Ministers. The success of the April 26 session in face of the rump CoR’s obstruction prompted it to disband and reform as an opposition bloc on April 28. The bloc, the Reform Front, immediately boycotted the CoR, as it maintained the fundamental principle of the rump CoR that Juburi was not the legal Speaker. The legal CoR lost momentum between April 26 and April 30, likely because the April 30 session was set to vote on major ministerial positions that political blocs, including the Kurds, were unwilling to relinquish. Several parties, including the Kurds and the Sadrist Trend-affiliated Ahrar Bloc, refused to attend the session, so it failed to meet quorum. Sadrist protesters then stormed the Green Zone on April 30, leading to a mass exodus of political parties from parliament. The protests had severed any chance of regaining the momentum of the reshuffle process. 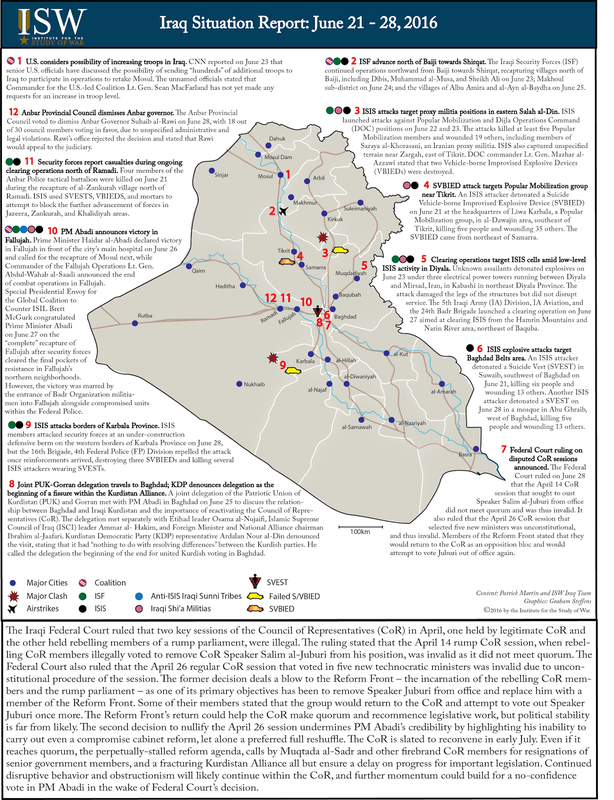 The political process subsequently froze in Iraq for nearly a month as each party set specific conditions for its return. Juburi met with political leaders prior to May 29 ostensibly to discuss the agenda for the CoR session and likely to mobilize members to meet quorum. He stated that the session would be held “in solidarity” with security forces in Fallujah, who were then on the verge of entering into the city limits. This language set a patriotic tone, which many have cited as the reason why enough individual CoR members and political parties attended the session. An unconfirmed number of Kurdish members attended; Kurdish members withdrew from Baghdad on May 1 after security forces failed to protect the CoR from protesters on April 30. The returning members were likely affiliated with the Patriotic Union and Kurdistan (PUK) and Gorran, who have shown a greater inclination to return to Baghdad than the leading Kurdistan Democratic Party (KDP). The PUK also previously announced on May 22 that it would attend any future CoR session, indicating that Kurdish participants were likely from the PUK. The Sadrist Trend-affiliated Ahrar Bloc did not attend the session and continued to demand a vote on a technocratic Cabinet in order to secure its return. Initially five members short, the May 29 session ultimately reached quorum. PM Abadi made a surprise visit to the session, where he spoke of operations in Fallujah and Mosul and announced his intent to soon present the rest of the ministerial nominations for a CoR vote. Like Juburi, PM Abadi used the operation in Fallujah to call for political solidarity. He will likely continue to try to capitalize on the patriotic ethos in order to reset the political conditions and pass both required legislation and his reform agenda. PM Abadi also needs the political climate to remain stable to provide basic security throughout the country as ISIS attacks are likely to increase during the holy month of Ramadan. The CoR session failed to address both the ministerial reshuffle further and the legislation needed to receive the IMF loan. The IMF had stipulated on May 12 that the Iraqi Government reduce its 2016 federal budget as a condition for receiving major loans from both the IMF and other international financial institutions. Reducing the federal budget requires parliamentary legislation. The May 29 session unanimously voted to extend the legislative term one month and adjourned until May 30. That session was postponed one day on the prospect of larger numbers of CoR members joining the session, primarily those from the Reform Front. Juburi stated that there were “positive signs” and that he had received a “serious letter” from the Reform Front on the need to hold a unified session. The session did meet on May 31, and several Reform Front members attended. However, the CoR announced that it was on a legislative holiday, usually taken during Ramadan, and that the May 31 session was an extraordinary one. At the session, members further discussed operations in Fallujah but still did not address the IMF loan or the cabinet reshuffle. Juburi announced that the CoR would adjourn until July 1, with the possibility of holding extraordinary sessions when needed. Since May 31, the political scene in Iraq has fallen silent. The Federal Court convened its first session on May 25 to rule on the constitutionality of the April 14 and April 26 CoR sessions. The rump CoR voted to dismiss Speaker Juburi on April 14, and on April 26 the legal CoR approved the five ministers under PM Abadi’s Cabinet reshuffle. The Reform Front maintains that the April 14 session met quorum while challenging that the April 26 session chaired by Juburi met quorum. Likewise, the legal CoR rejects the April 14 session as legitimate and upholds the constitutionality of the April 26 session. The Federal Court is likely pursuing a strategy of delay in order to force political parties to come to an organic agreement. If the strategy fails, a court ruling could further complicate the political crisis and will likely result in blowback. The Federal Court thus ruled on May 25 that experts were needed to assist in the case; it adjourned the session until May 29, which coincided with the resumption of the CoR. The Federal Court resumed the morning prior to the CoR session, swore in two experts for the case, and then adjourned until June 8 when the experts would present their initial findings. The court later announced on June 6 that the June 8 session would only discuss the appeals against the April 26 session, further delaying discussion of the April 14 rump CoR session. The CoR will be well into their legislative holiday by June 8, so the results will have no immediate effect. The impending decision of the Federal Court is linked to the conditions of the return of the Reform Front as it refuses to return to the CoR as long as Juburi remains chair. This attitude, however, precludes the group from negotiating with other political parties who do not consider Juburi’s position as up for negotiation. Moreover, the Reform Front’s stringent demand that Juburi is removed is a high risk to take if the Federal Court rules in Juburi’s favor. The Reform Front does not currently operate under a unified framework. The Front is divided between two dominant parties, elements of the Dawa Party that support former Prime Minster Nouri-al Maliki and members of Ayad Allawi’s Wataniya party. These two parties, as well as Maliki and Allawi, will use the Reform Front’s size and leverage to accomplish their own interests in the CoR. Both Maliki and Allawi will also try to commandeer the Reform Front as a vehicle for their return to power. Despite the political freeze, events continue to progress that require parliamentary participation and approval, including the impending IMF loan. Operations in Fallujah will soon require parliamentary discussion on reconstruction efforts and management of the internally displaced refugees (IDP). The CoR will not wait for the Reform Front to participate if it can achieve quorum without them. The risk of being left behind in the CoR has also split the Reform Front between those who would and would not compromise with the CoR in order to return to the political process. Many hardliners in the Reform Front maintain that they will not return until the Federal Court reaches a decision, and they have stated that they will not accept any “political settlement” for their return. These hardliners have also denied reports that the Reform Front is discussing proposals on how to return to the CoR session if Juburi survives the Federal Court case. The Federal Court’s delayed ruling on the April 14 session further jeopardizes the Reform Front’s relevancy if it remains distant from the political stage for too long. The Front will also lose its leverage if the CoR can find a way to resume the political process without the opposition bloc. The continued delay has forced the return of Reform Front members who cannot afford to wait for the Federal Court to come to a decision - a reported ten Reform Front members attended the May 29 session. Some of the members were reportedly from Anbar Province and had to attend the session because it dealt with Fallujah. The Reform Front’s boycott is incompatible with individual partisan responsibilities, and those members will need to remain active in the decision making process in order to serve their constituencies and further their unique party interests. The May 31 session also reportedly included several Reform Front members. A Reform Front member had stated that 15 members had elected to attend the session as an opposition party, rather than boycott the sessions until Juburi was removed from his position. These members may be under similar pressure to remain active in the political scene in order to achieve specific demands. Their participation may also suggest that the hardline approach is unsustainable as a party line and that the Reform Front does not have the vision to be a functional political entity. If the Federal Court invalidates the rump CoR’s actions, the hardliners will likely remain divided between Allawi and Maliki while the compromisers will likely return to the CoR, either to their former political parties or as a weakened opposition bloc. If the Reform Front wants to remain a credible political entity in the CoR, it must create a political agenda that can exist outside the simple black-and-white framework of whether Juburi remains as CoR speaker. The Kurdistan Alliance withdrew from the political process on May 1, citing the failure of security forces to protect CoR members from the protesters on April 30. The Kurdistan Alliance later announced on May 5 that the conditions of their return were centered on financial concessions from Baghdad. The international community and major political officials in Iraq engaged the Kurdish parties the following two weeks to secure their return to the CoR, focusing the majority of these efforts on the PUK and Gorran, both opposition parties within the Kurdistan Regional Government (KRG). The softening of the PUK and Gorran’s stance regarding the enticement of the impending IMF loan compounded by the announcement of a new political alliance between the PUK and Gorran on May 18 led to the fracture of the Kurdistan Alliance, as the leading KDP party remained opposed to returning to Baghdad. The PUK announced on May 22 that it would return to the next CoR session, breaking from the umbrella of the Kurdistan Alliance. It later appended its statement on May 23 to note that their return would follow negotiations alongside other Kurdish parties with PM Abadi regarding their demands. Kurdish political leaders met with PM Abadi on May 28 to discuss conditions of their return, but they failed to extract any valuable concessions. The KDP was not present at that meeting. 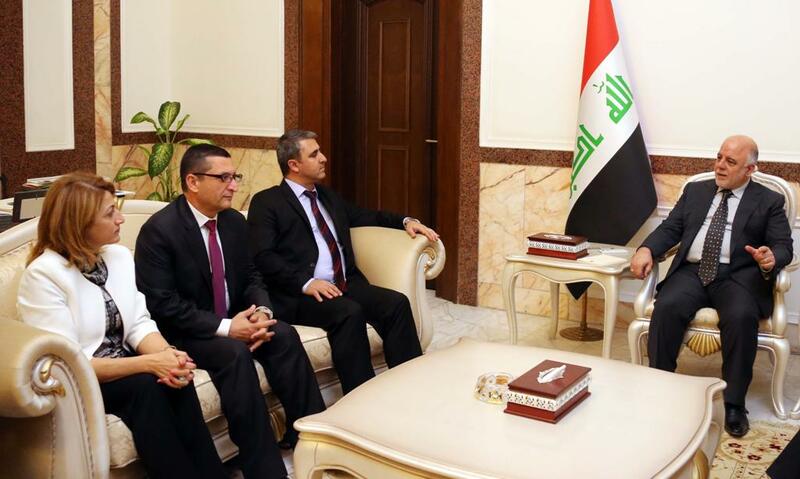 Pictures have shown only PUK parliamentary leader Ala Talabani, Gorran parliamentary leader Hoshyar Abdullah, and Gorran Second Deputy Speaker Aram Sheikh Muhammad with PM Abadi. 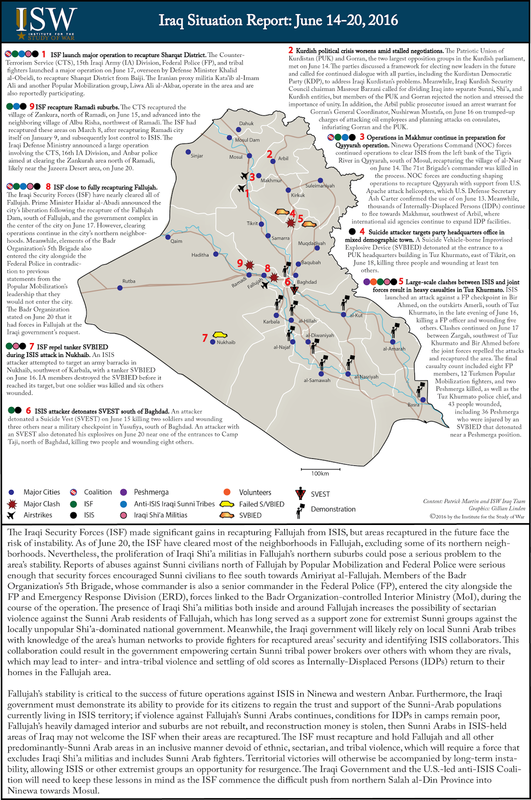 A later report on June 6 confirmed that three Kurdish parties went to Baghdad and participated in the CoR sessions – the PUK, Gorran and the Kurdistan Islamic Union (KIU) as the likely third party – while two remained in Iraqi Kurdistan, the KDP and likely the Kurdistan Islamic Group (KIG). The Kurdish Alliance previously enjoyed its power in numbers as it occupied nearly one-fifth of the parliamentary seats. The Kurds could leverage their unified size in the CoR in return for financial concessions. The splinter of the political process highlighted internal fractures within the Kurdistan Alliance, however, primarily between the PUK and Gorran and the KDP. When individual parties sought concessions from Abadi outside of the Kurdish Alliance, the parties no longer had the upper hand in negotiations. As such, the Kurdish blocs returned to the CoR without much to show for their month-long boycott. Kurdistan Islamic Union (KIU) parliamentary leader Muthanna Amin stated that PM Abadi during the May 28 meeting had not signaled any intention of granting the Kurdistan Regional Government (KRG) any portion of international loans. PM Abadi has not made any public indication to support or deny this accusation. The greatest incentive for the Kurdish parties to remain active in the political process was the prospect of receiving a significant international financial assistance, notably the IMF loan, which could drag the Kurds out of their own economic crisis and support ongoing military operations. Kurdish members may have returned to the CoR on May 29 without the guarantee of financial concessions in hopes that it can more easily extract concessions from within Baghdad than from Arbil. The Kurdish parties do not have the individual clout to seek negotiations in Baghdad, however, and are at risk of receiving less financial assistance from Baghdad than they did before. The federal government has effectively outlasted the Kurdish boycott and eliminated the Kurdish leverage over the government. The Kurdish parties will use the month-long legislative holiday to regroup, and it is likely that they will present on July 1 a more unified framework towards the federal government. PUK Second Secretary General Barham Salih stated on June 1 that the PUK would work to maintain relations with the KDP and stressed the need for coordination between all Kurdish political actors in the interests of Iraqi Kurdistan. KDP member and KRG Prime Minister Nechirvan Barzani reaffirmed the need for dialogue between Baghdad and Arbil. He stated that there is no intention for a KRG delegation to visit Baghdad, but that some Kurdish political actors may go “individually.” An unconfirmed source leaked on June 2 that the major parties in the KRG had reached an agreement to redistribute positions in the Kurdish government, suggesting that Gorran would resume the position of parliamentary speaker, and the KDP would give the position of prime minister to the PUK as President Masoud Barzani would stay in his position. This agreement would continue until 2017 elections. The report is unverified, but it suggests that the Kurds have witnessed the blowback caused by a lack of Kurdish consensus in Baghdad and are reevaluating how the Kurdish political parties operate in both Baghdad and Arbil. The ongoing financial issues in the KRG will push the Kurds to resurrect the Kurdistan Alliance as the Kurdish parties are unlikely to give up demands regarding financial assistance. KDP member Najiba Najib spoke on behalf of the Kurdistan Alliance on June 4, calling for 17% of any financial assistance given to Iraq as a constitutional right. Iraqi Kurdistan, as a part of Iraq, legally stands to gain a portion of any financial assistance given to Iraq. The specific percentage is not constitutionally specific and 17% is the percentage of the Iraqi federal budget allocated the region each year. Najib had previously stated on May 10 that the “partnership between Baghdad and Arbil had collapsed.” Najib’s inflammatory rhetoric likely aimed to drive Baghdad to offer greater concessions in order to prevent political separation between Arbil and Baghdad. The KDP will likely try to restore the leverage that the Kurdistan Alliance had in early May when they announced the boycott in order to receive financial support from Baghdad. The KDP, however, will also try to restore the Kurdistan Alliance in a way to benefits their party interests and reestablishes their dominance over the other Kurdish parties, most notably the PUK-Gorran Alliance, which formed on May 18. KDP member Kamal Kujar stated on June 6 that the split in the Kurdish parties over the return to the May 20 and 31 sessions was a “misunderstanding,” and that the PUK now “regrets” their return to Baghdad as PM Abadi did not guarantee any of their demands. Kujar announced that the Kurdish parties share a common “vision” of returning to Baghdad, but that the Kurdish people pressured the Kurdish parties to boycott the CoR and demand concessions from the federal government. The KDP will likely leverage the PUK’s failure to achieve concessions from Baghdad in order to pressure the PUK to return to a Kurdish agenda determined by the KDP. The Ramadan holiday will likely witness internal Kurdish negotiations regarding the timeframe of a full Kurdish return to Baghdad and the political stance of the Kurdistan Alliance regarding the Iraqi Government. The KDP knows that the PUK cannot return to Baghdad successfully without it, so the group will likely use their own return as a bargaining chip to maintain their dominance in Kurdish politics in both Baghdad and Arbil. The PUK can undermine this leverage by threatening to return to Baghdad alone, but doing so would both undermine the group’s ability to gain concessions for Iraqi Kurdistan and alienate the party from the greater Kurdistan Alliance. The KDP could use the PUK’s misstep to reaffirm its preeminent position in the KRG and resume negotiations with Baghdad with the full force of the Kurdistan Alliance behind it. The conditions in Iraq by July 1 will likely require urgent action in the CoR, possibly allowing the Kurdistan Alliance to re-secure its leverage over Baghdad. Operations in Fallujah will likely have progressed into the city, and as ISIS is squeezed out it will increase attacks in other areas as retaliation. The financial situation is unlikely to improve given ongoing military operations, and the Iraqi Government will likely find itself burdened with an increased IDP crisis following operations in Fallujah. The Iraqi Government will no longer have the flexibility to further delay the CoR and political process to its benefit. Instead, it will need to meet the conditions of the Kurdish parties’ return in order to maintain a CoR quorum and pass needed legislation. The Kurdistan Alliance will likely have the opportunity to reform its conditions, and if it can present reasonable and feasible ones, the Iraqi Government will likely meet them.